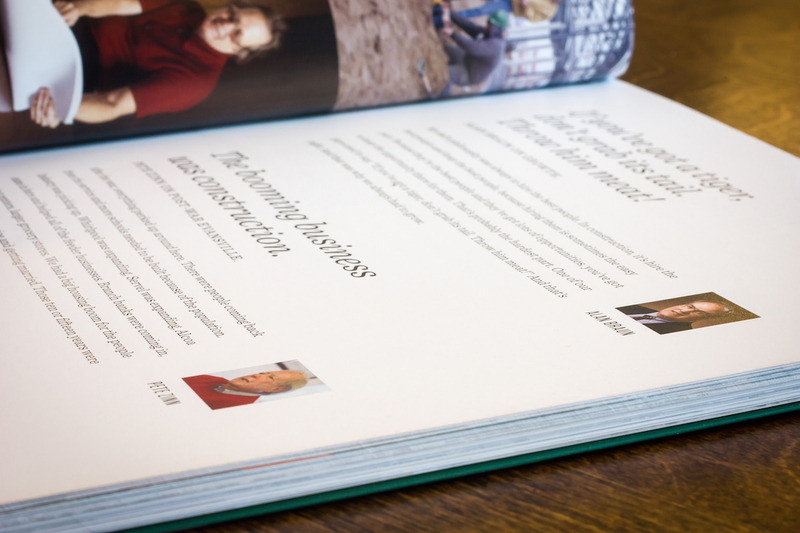 In early 2014, the marketing director of IC Skanska asked us to develop a kind of “coffee table book” commemorating the 50th anniversary of Industrial Contractors, Inc. (ICI). ICI was founded by Charles Braun in 1964 and grew to become one of the largest and most respected construction companies in the Midwest. In 2011, the Swedish construction conglomerate Skanska purchased ICI from the Braun family, and in a sense, our job was to capture the essence of the “old” ICI. The book, “BUILT STRONG,” is a the result of nearly 60 interviews with former and current employees, clients, and family members recorded over a 6 month period in 2014. The book was designed by Matt Wagner and Nick Basham. 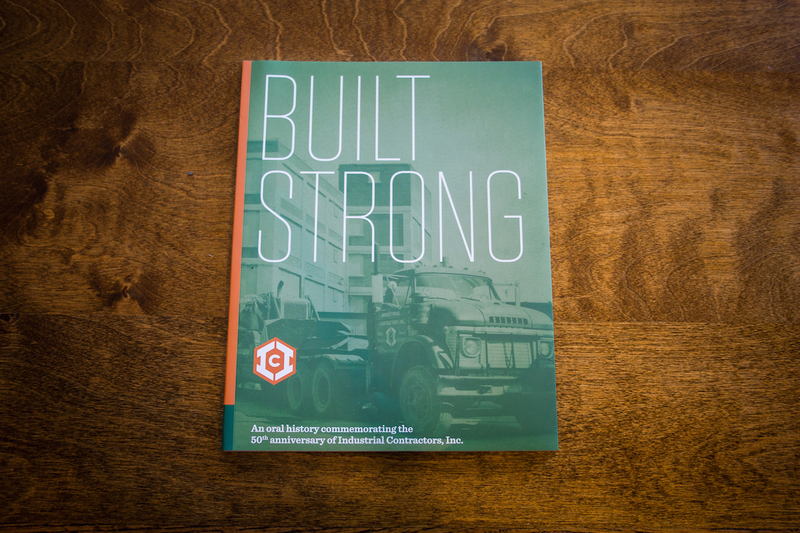 This book is a celebration of the men and women whose hard work, intelligence, and character made Industrial Contractors one of the largest and most respected general construction companies in the Midwest. The pertinent facts about the history of the company are these: in December of 1964, Charles Braun, Sr., at 54 already a veteran of the Evansville construction business, mortgaged his home and borrowed much more to purchase Industrial Contractors from Polaris Corporation, a Milwaukee-based holding company that had previously acquired it from Ferris Traylor of Traylor Brothers, a large local contractor. Under the leadership of Charles Braun and eventually his son Alan, the company grew to a size and scope that was probably unimaginable to either of them. Industrial Contractors has had a tremendous impact on the Evansville community, and not just in terms of the built environment – the beautiful schools and hospitals, the gleaming office buildings and banks, the vast stadiums and shopping centers, the bewilderingly complex factories and power plants. Industrial Contractors participated in the construction of nearly everything good and useful we have. This book is a reminder that these buildings didn’t just happen. They were designed and built by people, over 40,000 ordinary men and women with their own stories, their own values – men and women who worked hard for the American Dream: a rewarding job, a good life, a comfortable retirement, and the time and resources to raise their children and send them to college. Everything necessary for a community to thrive. Industrial Contractors gave them the opportunity to achieve that dream. When Harlan Batteiger recalls how his passion for construction began in the 1950s as a water boy carrying buckets of water to workers building Mater Dei High School where his father was superintendent, or when Allen Flick describes what it was like to be a young apprentice electrician working for Industrial on the first Old National Bank tower, which was 18 stories tall, and coming home at the end of the workday so tired from climbing stairs that he collapsed on his kitchen floor, unable to move, and that he did it “because I wanted that job so bad,” we begin to understand that for many of the individuals in this book, working in construction, building things, was more than a job. It was a calling. 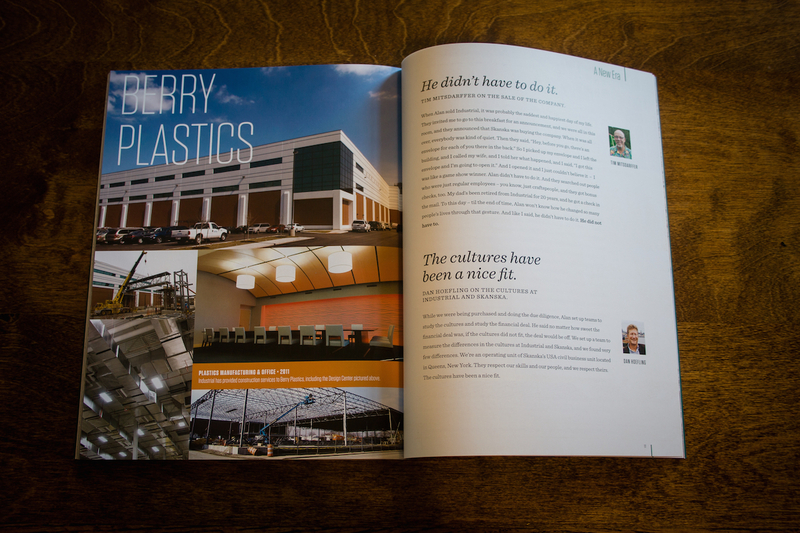 These stories may lead some to believe that the best days of Industrial Contractors are bygone days. But that’s not true. As the company grew larger and more capable, it appeared on the radar of Skanska USA, a global giant in the construction industry, and, in December of 2011, Skanksa purchased Industrial Contractors from the Braun family. Today, Industrial Contractors Skanska is being led by a new generation who are as passionate about doing great work as the generation before them who built the first engineering building for Alcoa in an empty field in Warrick County in 1960. It seems fitting in a way. Just as Charles Braun and his wife Margaret gathered their courage and risked everything to realize his vision of a first-class construction company, the wise folks at Skanska saw something here in Evansville, something worth taking a chance on. They saw what you will see here in these pages – something of real value: the extraordinary men and women at Industrial Contractors. Enjoy their stories.